Oulton Park Round 10 of the British Superbike Moto3 Championship saw a great weekend for young rookie Scott Swann. Qualifying began on a wet track, Scott felt comfortable in the conditions and started off really well, after holding 3rd place for a time, he was to end the session off in 4th place, his highest qualifying spot yet. 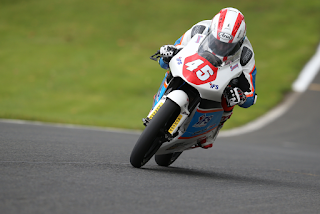 The first race was dry but it didn’t go so well for Scott, he missed out on making the most of his good qualifying position and didn’t get the Moto3 Honda off the line to well and by the end of the first lap he was back a few places in 8th. On the second lap Scott made a few mistakes and dropped back another few places to 10th, where he then rode the remainder of the race on his own. Still a good result but not where he wanted to be after such a good qualifying. The second race started in wet conditions and Scott was determined to make up for race 1. 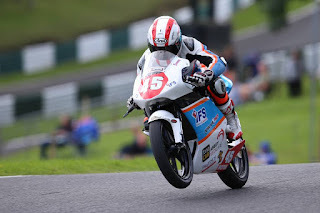 He got a great start from the back of the grid and by the end of the end of the first lap he was up to 6th place and chasing a group of 4 riders at the front of the class, Cook, Rodrigues Strudwick and Jack Scott . By the end of the next lap Scott had caught the group and pulled away from the following group of riders behind. They stayed together for the remainder of the race, swapping places every lap, with Scott getting up to 3rd for a while. Going on to the last lap Jack Scott and Thomas Strudwick got back past again pushing Scott back to 5th, then braking in to the last corner Scott made a big effort and squeezed up the inside of Strudwick to get 4th to the line and just 0.4 seconds off a possible first ever Moto3 rostrum. His highest place finish so far. A huge thank you to all our sponsors and everyone that helps and supports our team.